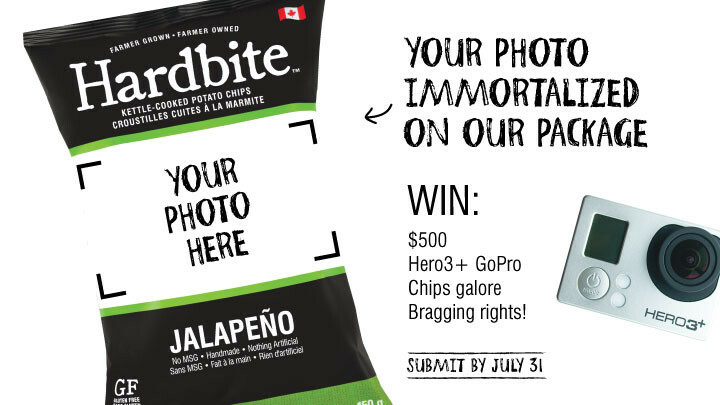 We want one of your photos to grace the package, injecting thousands of grocery shoppers with a shot of local pride and sizzling summer heat. Oh, and there’s also some great prizes up for grabs, including $500, the wickedly wild GoPro HERO3+ Black Edition. And did anyone say free chips? Upload up to three of your stunning original high-res photos of a favourite BC summer activity by July 31st, 2014. A panel of uber-qualified judges will select the top 25 finalists to face-off in a public vote. If you’re a finalist, you’ll need to recruit your friends and fans to vote for your photo to win. The entry with the most votes on August 31st becomes our grand prize winner. Show us what you love about living in BC! Hiking, biking, surfing, swimming, cliff jumping… you get the point. Judges will be looking for image quality, composition and how well it screams Jalapeño! Harbite Jalapeno chips can best be compared to an adrenaline rush: exciting, daring and darn satisfying. Your photo should be too. Looking to earn bonus points? Take a look at our existing packaging and you’ll notice little touches like sun flares appearing consistently. Judges will notice things like that too.